According to the Bible, in the days of Peleg, the earth was divided (Gen 10:25). There are a variety of modern readings of this. Creationists (those who believe the earth to be only 6000 years old) believe this is when the continents divided. Many believe this is when the earth was divided up among the sons of Noah (see: Peleg - Wikipedia, the free encyclopedia). However, the oldest and perhaps best reading comes from ancient Semite/Hebrew belief. In Genesis 10-11, we see the “Table of Nations”, when the 70 major descendants of Noah established themselves. According to the older traditions, these are the men from whom the first kingdoms of earth came about. It also has another context. In the earliest Semitic traditions, God has a divine assembly of sons (Hebrew: bene ‘elim or Sons of El/God). In the earliest traditions, there were 70 of these divine sons. Elohim divided up the nations among his sons, for each of them to rule and reign over a kingdom. His eldest son, Yahweh/Jehovah was given the prize kingdom: Israel. As we go through the Old Testament, we shall see hints of the divine council at work, and times when they actively seek to overthrow one another (see Job 1 for an example of the competitive nature among the gods in the Old Testament). Yahweh/Jehovah was given Israel as his people. But they were not yet a people. Yahweh received only one individual with whom to begin his kingdom: Abraham. But it is in Yahweh’s goal of conquest of the world (over the other inferior gods) that he foresees the expansion of his reign through Abraham. It is in this beginning that we will be able to approach the Abrahamic Covenant. Outside of the Bible, we have access to a variety of stories regarding Abraham. Several of the stories overlap, and some use different stories to explain events in the Bible. The books we’ll review are: the Quran, Genesis Apocryphon (from the Dead Sea Scrolls), Book of Jasher (medieval Midrash), Testament of Abraham (ca 100-200 AD), Apocalypse of Abraham (ca 100-200 AD), and Book of Jubilees (2nd century BC). As for his birth and childhood, we find, “Some Muslim accounts also place Abraham in a cave for fifteen days after his birth. During this period his mother was not able to breast-feed him because she could not risk being seen going to the cave and arousing suspicion. One day she sees Abraham sucking his fingers and she notices that from one finger he is sucking milk, from another he is sucking water, from another honey, and from another he is sucking butter. In the fifteen days that Abraham stays in the cave he grows in one day as if it were a month and in one month as if it were a year. Abraham is said to have been the equivalent of fifteen years old when he left the cave.32 Jewish tradition also places Abraham in a cave at birth. In one tradition God opens two windows in the cave: one puts forth oil and the other a fine flour.33 In another "Abram, lying alone in the cave without food, began to weep; but God sent the archangel Gabriel to give him milk, which flowed from the little finger of his right hand—and so the child was suckled. "34 The motifs of the cave and miracle feedings can also be found in the Christian tradition in which angels bring sustenance to saints in need” (Brian M. Hauglid, The Book of Abraham and Muslim Tradition, Astronomy, Papyrus, and Covenant - The Book of Abraham and Muslim Tradition ). The concept of Abraham gaining nutrition from sucking his fingers was also known in Egyptian thought. There are reliefs and statues, showing Ramses II sucking his finger as to gain the knowledge of Horus. Ramses imitates the young Egyptian god Horus in gaining sustenance and wisdom by sucking on his finger. It also represents maintaining holy silence/stillness. In the Testament of Abraham, the Lord commands Michael the archangel to go down and prepare the elderly Abraham for his death. There are two versions of the story, one in which Abraham is very reticent to die, and refuses often to go with Michael. In the other version, the Lord wishes to prepare Abraham by granting him a wish: to see the world. Michael takes him above to view the world. But as Abraham sees evil occurring, he curses the wicked and they quickly die. To stop Abraham from annihilating the world, God tells Michael to take Abraham instead to the doors of heaven. There are two doors, one leading to heaven and the other to hell. Abel, Adam’s son, sits in judgment before the two doors. Each person’s good and bad acts are weighed, and the person goes according to which is greater. This goes back to the Egyptian Book of the Dead, where the dead’s earthly works are judged on a great scale. Two parts of an Egyptian Judgment scene. 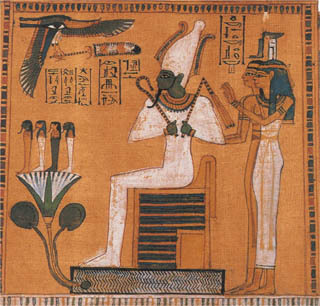 Osiris sits on his throne, as the person is brought forth (man dressed in white). His deeds are placed on the balance and compared with a feather of truth (Maat). If viewed as righteous, he will dwell in peace in the underworld. If wicked, he shall be devoured. In the Testament of Abraham, Michael leaves Abraham occasionally to return and report his actions and questions to God. Finally, God sends down Death, dressed in glorious attire, to take Abraham to his final resting place. The Quran is broken up into main chapters, called Surahs. Each Surah has a focus on an event or individual. Abraham is mentioned in several Surahs. Surah 19 (Mary) – In this Surah, Abraham tries to convert his father to worship God. Terah threatens to stone Abraham is he does not leave him alone. Abraham chooses to leave the area, and God promises to create a great people out of him through his children. Surah 21 (the Prophets) - Here, Abraham destroys the idols and blames it on the chief idol. The people anger against Abraham. Just as the Book of Abraham shows the prophet being sacrificed, the people seek to slay him in the fire pit (see also Surah 37:83-113). 71. But We delivered him and (his nephew) Lot (and directed them) to the land which We have blessed for the nations. In Surah 29 (the Spider) verses 14-27, again Abraham chastises the people for idol-worship, seeking to have them obey God or be destroyed. Noah and the Flood are referenced, and God explains: 19. See they not how Allah originates creation, then repeats it: truly that is easy for Allah. 20. Say: "Travel through the earth and see how Allah did originate creation; so will Allah produce a later creation: for Allah has power over all things. God is continually in the process of creating and destroying. He created with Adam, destroyed in the Flood, and created again with Noah. Since Terah and the people are rejecting God and going after idols, God will recreate the earth through Abraham and the covenant. In the Dead Sea Scrolls was found the Genesis Apocryphon, or Tales of the Patriarchs. Because of the famine, Abraham goes down into Egypt, where Pharaoh takes Sarai, Abraham’s sister/wife, to be his own wife. Abraham thrived in Egypt. Pharaoh’s advisers “came having heard of my words….They asked me for knowledge of goodness, wisdom and righteousness, so I read to them the Book of the Words of Enoch.” This possibly was one of the Hebrew books that Abraham found in his father’s home, according to the Book of Jubilees (see above). Pharaoh weds Sarai and seeks to consummate the marriage, but he cannot approach her. Instead, a plague falls upon him. Abraham is called for “so I prayed for him, that blasphemer, and laid my hands upon his head. Thereupon the plague was removed from him…and he was healed” (The Dead Sea Scrolls - Revised Edition: A New Translation by Michael O. Wise, Martin G. Abegg, and Edward M. Cook). In this, we see that Abraham had access to Enoch’s writings. We also see he had the power of God to heal the sick by the laying on of hands. After his sojourn in Egypt, Abraham returned to Canaan, the land of promise. Near Beth-el, he made the covenant with God. The Book of Jasher tells us that Nimrod was king of the land (chapter XI). Terah is the captain of Nimrod’s host, and so has a very close relationship with Nimrod. You will remember from the previous lesson, the stories of Nimrod in the Bible and elsewhere tell us of a great hunter. He wore the stolen garment of Adam, which allowed him to approach man and beast with power. He became the sovereign king of the world, and built the Tower of Babel. After the crushing defeat at the Tower, Nimrod finds a new enemy: Abraham. When he was 50 years old, Abram visited his father, Terah. He sees the 12 idols in their temple that all the people worshiped. Terah created all 12 of the idols. Abram decided to test the idols, to see if they were worthy of worship. Bringing them a meat offering, he found they could not reach for the food. They were unable to hear, speak, eat, or move. He mocks them, rather than worship them. He returns soon after with a larger offering. When they do not move, Abraham breaks them up with a hatchet, except for the largest idol. He places the hatchet in the biggest idol’s hand. Later, Terah finds the ruined idols and accuses Abraham. Abraham explains that he brought them meat. They all greedily reached for the offering; the biggest one freaked out and started chopping up the other idols. Terah sees through Abraham’s logic, because after all, he had created these idols in the first place. Terah complains to Nimrod. Nimrod brings in Abraham, who commands the king to repent of his sins and idolatry. Abraham is imprisoned. Nimrod decides to make an example of him, and casts him in a fiery furnace, along with his brother Haran. Haran immediately dies in the intense heat, but Abraham continues for 3 days without suffering any harm. The story is very reminiscent of Shadrach, Meshach and Abednego (Daniel 3), who also went before a king of the region (Nimrod and Nebuchadnezzar were both kings of Babylon/Assyria region). When Nimrod sees that Abraham cannot die, he releases him. However, he fears Abraham will overthrow him, and Abraham is forced to flee to Noah and Shem’s home. It is possible that this is when Abraham was ordained to the Melchizedek Priesthood, as he was ordained by Melchizedek (Jewish tradition says this is Shem. See D&C 84:14). He hides there until God tells him to go to Canaan. In chapter XIII, Abraham is blessed with the covenant in Canaan (see vs 7-8, 17-19, 23). As Abraham goes down into Egypt, we get a new story regarding Sarai. In chapter XIV, she is held captive by Pharaoh, who seeks to bed her. But Sarai prays intensely to God for deliverance, and an angel delivers her by plaguing Pharaoh and his house. The Apocalypse of Abraham begins with Terah building gods of stone and wood. As Abraham assists Terah in moving the idols, Merimath’s head falls off and the stone body breaks. Terah must create a new body for Merimath. Abraham thinks, this god is not that great, if he cannot stop himself from falling, and must have Terah recreate a body for him. Soon after, a wooden god catches flames in a fire, and ends up as ash. Terah makes a new one. Abraham asks Terah why he isn’t their god, as he has recreated them. Abraham chooses to seek the true God, and is called to leave Terah and the idols. Abraham is taken to a high mountain top, where he sees the cosmos and the heavens. Then, Abraham sees a building with an altar, and asks: “what is the handsome temple which I see?” (chapter 25:3). The Lord answers: "Hear, Abraham! This temple which you have seen, the altar and the works of art, this is my idea of the priesthood of the name of my glory, where every petition of man will enter and dwell; the ascent of kings and prophets and whatever sacrifice I decree to be made for me among my coming people, even of your tribe” (ch 25:3-4). Abraham foresees his descendants rejecting the covenant, sacrificing God on his own altar (ch 25:1), and the Temple being destroyed by Israel’s enemies. Abraham sees the restoration of the people and the temple. He then foresees the coming of the Messiah, whom the Gentiles would embrace, but many of Abraham’s descendants would mock and abuse him. In the last days, there would be 10 plagues sent upon the wicked nations, and then all would be judged a final time by the “Elect One,” who would come down from above. God’s hope is that all would repent, rather than burn in hell for following “strange gods” (chapter 31:61). Each of these stories at least hints at the Abrahamic covenant. A covenant is an agreement between two beings. Each promises to do his part. Ancient covenants were based upon a trust, most modern people in the West do not understand. When Nephi tackled the escaping Zoram, and promised to let him live as a free man IF Zoram agreed to come peacefully with them, all it took was an oath from Zoram to allow both men to breathe easily. Nephi used the two biggest things a person could use for promising: his own life and God’s: “as the Lord liveth, and as I live” (1 Nephi 4:32). Zoram “did take courage at the words which I spake” (vs. 35), as he knew Nephi would not lie in an oath like this. And once Zoram had also sworn the oath, Nephi and his brethren were no longer worried about him escaping back to Jerusalem. This is the ancient Middle Eastern view of oaths and covenants. One truly was most evil if he ever broached an oath or covenant he had made. Abraham and Nephi’s covenants with God were so strong that both would obediently slay a person if God commanded (Nephi slew Laban, Abraham would sacrifice Isaac). These slayings were part and parcel of proving their loyalty to God and to the covenant. Such dedication to covenants was not limited to the righteous, as Cain’s secret combinations contained covenants so compelling, to withdraw from the covenant meant a death sentence. As mentioned before, Yahweh/Jehovah was selected as God of Israel. But there was no Israel, yet. Instead, Yahweh searched through Babylon, the kingdom of Nimrod, for one who would be his loyal avant-garde. Abraham does not take the worship of God for granted, but in the above stories, tests out the gods, to see which one (if any) would be worth worshiping. Only the God who nourished him as a babe in a cave, who gave him knowledge and wisdom regarding his livelihood and astronomy, and who carried him through the cosmos so he could see the true power of Yahweh, was able to hold Abraham’s confidence and faith. This confidence would build, as God and Servant walk together from one trial to the next. Even Sarai was able to develop her faith in God, as she was tried by Pharaoh and later by her long-awaited desire to have a child. The Book of Abraham teaches us that this covenant is tied to the priesthood, which Abraham eagerly sought for. As in the Apocalypse of Abraham, this covenant was one that would grow in power and stature, not just for Abraham, but for his descendants. Abraham was a nomad, but his descendants would build a temple, where Abraham’s priesthood would be in full display. The commandment and covenant God made with both Adam and Noah included multiplying and replenishing the earth. Abraham is promised that his seed would be numerous, as the sands of the sea, or the stars in the sky. These are promises that extend beyond the mortal life. From a human perspective, one’s name lives on forever. Here we are, about 4000 years after Abraham lived, and we still remember him. He lives on in all those who honor him, and all those who carry on his DNA. From a spiritual perspective, we understand that families go on forever. Abraham’s seed includes not only direct descendants, but all those who accept Yahweh/Jesus Christ as their God. Upon being baptized, a person inherits the blessings of Israel. Upon receiving the Melchizedek Priesthood, we receive the same priesthood Abraham sought after. We “become the seed of Abraham” (D&C 84:34) through the ordination to the priesthood. The Melchizedek Priesthood becomes a major component of the covenant of Abraham. All of God’s eternal promises with Abraham become ours when we are ordained and receive all the ordinances of the Priesthood. The highest form of Priesthood is the Patriarchal Priesthood. This occurs when a bearer of the Melchizedek Priesthood and wife are sealed together for time and all eternity in the temple of God. Just as Abraham was promised eternal increase/seed, so shall we. Just as Abraham is called the “friend of God”, so shall we. Just as Abraham laid hands on people and healed them, so shall we. Just as Abraham was given great power from God, so shall we. Part of the fullness of the covenant of Abraham is Abraham’s journey through the cosmos. While many think of destruction when they think of the term “apocalypse”, it actually comes from the Greek, meaning “lifting of the veil” or “revelation.” It is where God reveals his greatest secrets to an individual. In the scriptures and ancient texts, many people have received such revelations, including Adam, Enoch, Jacob, Moses, Isaiah, Nephi, Lehi, Brother of Jared, the apostles John and Paul, Joseph Smith, etc. Many of these visions began on a mountain top. Many of them included seeing the Lord. Lehi, Isaiah, and Abraham saw the Messiah come down to earth. Many of them saw the multiple levels of heaven and the cosmos. Some had temple experiences in their visions. Several of the visions included a book or books, which when read, allowed the prophet to prophesy. Lehi (1 Nephi 1) and Isaiah (Ascension of Isaiah) were given books to read and prophesied, Enoch wrote down in a book what he saw in heaven, Abraham read the Book of Enoch, John the Revelator ate a book and prophesied, Joseph Smith was given a prophetic book to translate. Prior to entering into Egypt, Abraham sought greater knowledge of astronomy, and the Lord showed him the cosmos and Creation (Abraham 3-5). All of this is part and parcel of the Abrahamic Covenant. God brought up Abraham to not only be his servant, but also be his symbolic likeness upon the earth. Abraham was shown the Creation and the cosmos, because one day he also would create things on such a large scale. As Paul taught in Romans 8, we are “sons of God, and if sons, heirs of God and joint-heirs with Christ” to receive of his glory and power, just as Abraham did.